Exploring the Calibre Mining/B2Gold Monte Carmelo Project in Nicaragua. Source: Calibre Mining Corp.
Calibre Mining Corp. [CXB-TSXV; CXBMF-OTC] on Friday October 5 announced details of a $5 million private placement deal and a 10-for-one share consolidation. 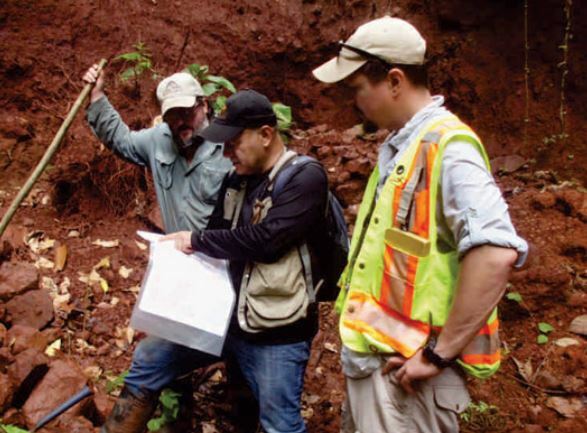 Calibre owns a 100% interest in over 413 km2 of mineral concessions in the Mining Triangle of Northeast Nicaragua, including the Primavera gold-copper project and Santa Maria gold project. Additionally, the company has optioned to IAMGOLD Corp. [IMG-TSX; IAG-NYSE] (176 km2) and Centerra Gold Inc. [CG-TSX; CAGDF-OTC] (353 km2) concessions covering an aggregate area of 429 km2 and is a party to a joint venture on the 33.6 km2 Rosita D. gold-copper-silver project with Rosita Mining Corp. [RST-TSCV]. Major shareholders in Calibre include B2Gold Corp. [BTO-TSX; BTG-NYSE], Pierre Lassonde, and management. On Friday, Calibre said it has arranged a non-brokered private placement financing for up to 11.4 million units at a post consolidation (as defined below) price of 44 cents per unit, to raise gross proceeds of $5 million. Each unit will consist of one post-consolidation common share and one common share purchase warrant. Each warrant will entitle the holder to acquire an additional common share for $0.95, on a post consolidation basis, for a period of five years from the date of closing. Sprott Capital Partners, a division of Sprott Wealth LP, and its affiliates will act as finders in the private placement. The company said it expects to close the private placement during the week of October 29, 2018. Proceeds will be used for exploration, project generative activities, loan repayment, and general working capital. It is anticipated that Calibre’s management and board of directors will acquire units of the private placement. The issuance of units to certain insiders of Calibre pursuant to the private placement will be considered to be a related party transaction within the meaning of TSX Venture Exchange Policy 5.9 and Multilateral Instrument 61-101. Prior to closing of the private placement, the company will consolidate its outstanding common shares on the basis of ten existing shares for one new common share. At Calibre’s last annual general and special meeting on May 23, 2018, shareholders of the company authorized the consolidation. So it only requires stock exchange approval, the company said. The company will have 42.8 million common shares issues and outstanding, working capital of approximately $4.7 million and no debt following the consolidation and completion of the private placement. On Friday, Calibre shares fell 27.27% or $0.015 to $0.04 on volume of 1.1 million. The 52-week range is 14.5 cents and $0.035. Calibre recently reported results from ongoing diamond drilling on the Eastern Borosi gold-silver project in Nicaragua. Highlights included 15.9 metres of 6.28 g/t gold equivalent at the La Luna gold-silver zone. Exploration at the project is being funded by IAMGOLD. Calibre recently secured $400,000 in loans from several directors of the company. The loans will bear an annual interest rate of 7.0% and will be payable in cash every quarter. The term of the loans is 18 months from the closing date, or March 5, 2020.